Well, speaking of authenticity, if you are going to be authentic then you really have to do it right. On the complete opposite side of the spectrum, what Bert Jansch was doing as a young man was deeply authentic and was genuinely very weird. Bert was a young person very much of his time but was making music that almost sounded ancient. From the guitar-playing point of view, he was innovating on an acoustic guitar in a way that was as powerful as Pete Townshend with electricity in The Who and as intricate as what Jimi Hendrix was doing with his space rock-blues. Vocally, Bert was almost punky and in the way he and his peers went about their lives, he was one of the very first lo-fi musicians - and that was 40 or 50 years ago. Bert was one of my few real heroes. I got to be friends with him for about ten years before he died. He was an amazing person and because we were friends I got to find out that the lifestyle choice of the folkies in Soho in the 60s was a very deliberate and radical. They made certain choices and the fact their music was not in the charts was no accident. In Bert's case, he was the king of the UK beats as a result of the beat poet influence on his generation. Also, he was tuned into the political climate of the time and things like the CND movement and the radical student scene. Bert was a lot more than an earnest folky with an acoustic guitar. I particularly like his second record. 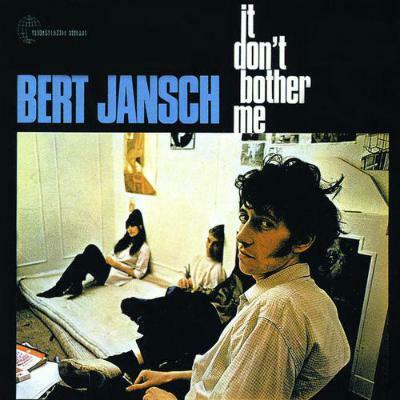 The album before it [1965's Bert Jansch] is more revered and held up by most journalists as being the seminal one, but I think the songs are better on It Don't Bother Me, particularly the title track. The fact that they were both recorded in a kitchen at his mate's house is another reason why it has never dated.